Dry Shampoo: a quick “wash” without water. An ideal solution when you’re in a hurry because you overslept. Or maybe too good to be true? Utopia explains what’s in there, how it’s used, and which environmentally friendlier options are available. Greasy, unruly strands of hair are stuck to your forehead, there’s no time for a quick shower, and you’ve got an important appointment today. Almost everyone, men and women alike, have found themselves in this position at one time or another. It’s the same for everyone with long hair. An abundant mane looks great, but its upkeep is incredibly time consuming. Washing your hair too often can even damage the strands and cause split ends, stripping your hair of moisture. One seeming solution is dry shampoo, which removes unnecessary oils from your scalp and hairline, leaving your hair looking fresh. Today’s formulations are supposedly reliable and quick, require no water, and leave no trace behind (unlike their predecessors). Sounds good, right? Unfortunately, there are still a few problems with this product. Dry shampoos don’t contain any harmful ingredients, but they’re no magic formula either. Every dry shampoo is primarily composed of basic ingredients you have around the house, meaning it’s easy to imagine making your own at a fraction of the price. The open secret of their efficacy: various starches bind to the oils from your scalp; after a few minutes, these are easily combed out together, leaving your hair less greasy. The effects of using dry shampoo are appealing, but experts warn that real washing cannot be replaced with dry shampooing alone. Dry shampooing, therefore, is a short-term solution – a temporary “freshening” – which does not provide any actual deep cleaning results. How Does Dry Shampoo Actually Work? The effective principle behind dry shampoo has been applied for centuries. Powders comprised of plant-based starches or talc are distributed throughout the hair and massaged into the hairline. This method was incredibly popular in the 18th and 19th centuries, when people bathed far less frequently than today. 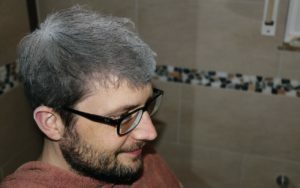 The grayish hair so commonly seen in portraits from this era was a result of this behavior — regularly powdering hair resulted in a noticeable gray tinge. For this reason, dry shampoos were long frowned upon; but in the last few years, they’ve made a significant comeback. Modern products absorb unnecessary oils and simultaneously provide more volume. Their formulation prevents grayish tinge, because it requires just a small amount in order to be effective, and because it can be easily removed through brushing. There are two different types of dry shampoo: spray-on and shaker application. Spray-on products must be shaken well before use in order to evenly disperse the dry shampoo particles. It’s then sprayed directly onto the needed areas, massaged in briefly with a towel, then allowed to sit for three minutes. Comb it out and you’re done! Powder applied from a canister is somewhat trickier to master. It’s easiest to apply it with a large makeup brush, since the shaker openings make it difficult to apply the correct amount directly to the hair. Shake out a little bit of the dry shampoo onto your palm or into a small dish and apply it where needed with the brush. This allows for even distribution throughout your hair. Massage it in, allow it to work for a few minutes, comb it out, and you’re ready to go. Beauty is suffering, so the old saying goes. In the case of dry shampoo, however, it’s the environment that suffers. While the main ingredient in most every dry shampoo is harmless rice flour, it’s the rest of the ingredients, especially in spray-on varieties, that are harmful to the environment. In order to ensure an even distribution of shampoo particles, spray cans release greenhouse gases like butane. This reason alone is enough to avoid these products entirely. Both types of dry shampoo include additional ingredients like essential oils (for scent), silicone, solvents (propylene), and alcohol, all of which can harm people with allergies or sensitive skin. Many product also contain talc which is now a suspected carcinogen. You should therefore always read the ingredients of your chosen products carefully in order to avoid any unintended health consequences. If you’re concerned about the health and environmental risks we outlined above, there’s one easy solution: make your own dry shampoo! You probably have all of the ingredients you need already in your cupboard – and it’s the cheapest option of all, too. Recipe #1: Organic corn starch. It quickly absorbs all unnecessary grease and is easy to comb out. To use, simply apply your hair with a makeup brush as with any other dry shampoo powder. Recipe #2: organic flour (wheat or rye, but not whole wheat). This also is easily applied with a makeup brush and does exactly what it should. Recipe #3: medicinal clay. If gray tinge is an issue with the other methods, then try medicinal clay instead. The clay comes in various colors, so you can choose one closest to your natural hair color. It’s as easily applied and works just as well as conventional dry shampoos. One final tip: for darker hair colors, mix a bit of organic cocoa powder into your dry shampoo alternative of choice. It prevents the gray tinge and has a lovely chocolate smell, too.